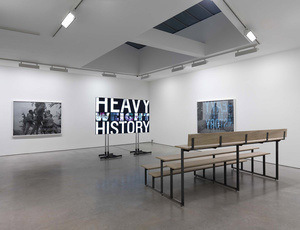 By utilising the medium of human relationships, the comedic slapstick humour of Formulae, or indeed any of the other innumerable tools of modern communication available, Christian Jankowski trades blows with history, politics and the language of art. 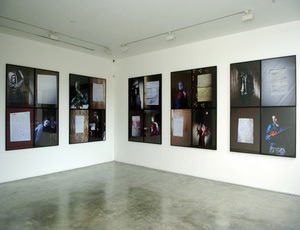 His works are almost always 'performances' – both literally and figuratively – in so far as his carefully calibrated set-ups and interactive scenarios engage occasionally unsuspecting collaborators: televangelists, fortune-tellers, border guards and professional magicians have all innocently colluded with him to become 'co-authors' of his wide-ranging work. 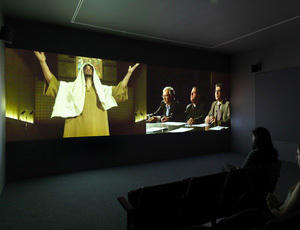 The collaborative nature of Jankowski's practice is paramount, as each participant often unwittingly contributes his or her own texture to the story. There is as much emphasis on the journey as the destination, and the risks and chances inherent in Jankowski's collaborations ultimately give surprising shape to the final works, whether these are photographs, paintings, sculptures or video installations. 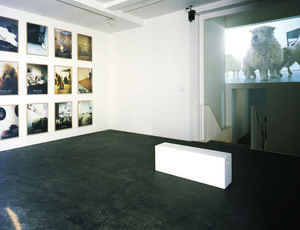 By foraging for food in a supermarket with a bow and arrow (The Hunt, 1992), renovating at exhibition space under the auspices of a reality TV show format (The Perfect Gallery, 2010) or selling a souped-up speedboat as a work of art at an art fair (The Finest Art on Water, 2011), Jankowski proves that he is not frightened to turn the camera, canvas or microphone back on himself. His playful and far-reaching projects tug at the very fabric of society itself, querying many notions of authorship, ownership, originality, propriety and authenticity that might otherwise be taken for granted. Christian Jankowski lives and works in Berlin. He was born in 1968 in Göttingen, Germany and studied at the Academy of Fine Arts, Hamburg, Germany. Recent solo exhibitions include Galeria Hit, Bratislava, Slovenia (2017); Haus am Lütowplatz, Berlin, Germany (2016), Kunsthaus Hamburg, Germany (2015), Center for Contemporary Art, Ujazdowski Castle, Warsaw, Poland (2013); Sala de Arte Publico Siqueiros, Mexico City, Mexico (2012); MACRO, Rome, Italy (2012); Nassauischer Kunstverein Wiesbaden, Germany (2009); Kunstmuseum Stuttgart, Stuttgart, Germany (2008); Miami Art Museum, FL, USA (2007); MIT List Visual Art Center, Cambridge, MA, USA (2005); Swiss Institute, New York, NY, USA (2001) and the Wadsworth Atheneum, Hartford, CT, USA (2000). He has participated in numerous group exhibitions Including 'Autogestion', Joan Miró Foundation, Barcelona, Spain (2016); ‘When I Give, I Give Myself’, Van Gogh Museum, Amsterdam, The Netherlands (2015); Project Los Altos (off-site show in Silicon Valley, staged by San Francisco Museum of Modern Art, CA, USA, 2013); Taipei Biennial, Taiwan (2010); Sydney Biennial, Australia (2010); the Whitney Biennial, New York, NY, USA (2002) and the Venice Biennale (2013 and 1999). In 2016, Jankowski curated the 11th edition of Manifesta, becoming the first artist to assume the role. Bronze 220 x 90 x 80 cm 87 x 35 1/2 x 31 1/2 in. Bronze 215 x 90 x 90 cm 85 x 35 1/2 x 35 1/2 in. Bronze 225 x 85 x 80 cm 88 1/2 x 33 1/2 x 31 1/2 in. Neon sculpture 200 x 120 cm 78.7 x 47.2 in. Two C-prints mounted on cardboard, titled and signed, recto Framed: 39.5 x 27 cm Framed: 15.5 x 10.5 in. Black & white photograph on baryt paper 140 x 186.8 cm 55 x 73 1/2 in. Black & white photograph on baryt paper 140 x 186.8 cm 187. 55 x 73 1/2 in. Neon sculpture 230 x 212 cm 90.6 x 83.5 in.